This article follows a recent early morning walk in the park by my home where beautiful rose bushes were in bloom all along the path. 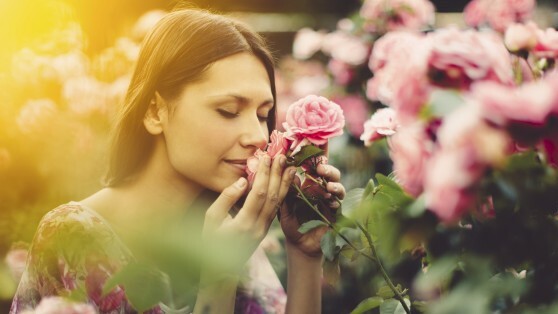 As a "workaholic on a healing journey," I have to remind myself regularly to stop and smell the roses. While we live and work in a high speed, high tech, demanding and competitive world, I believe it's our choice whether or not we get caught up in that chaos. We can skip lunch, grab a greasy burger and fries, or we can eat nutritiously and go for a 20 minute walk. We can register our kids in 4 activities a week or limit that to two. We can fall into bed exhausted at night or we can carve out an hour a day just for "me" time. I also believe that experiencing chronic stress has become a norm in our culture and that it's here to stay. One author recently referred to the phenomenon as culturally induced ADD. The first line of Rudyard Kipling's famous poem IF outlines the challenge I think we face as individuals: "If you can keep your head when all about you are losing theirs..."
If, like me, you have an ongoing struggle to change your ways, it may be motivating to consider the difference between acute and chronic stress. The Stress Response in humans evolved as an immediate (acute) instinctual reaction to being faced with a threat to our physical survival. Whether or not this threat is perceived or real,the brain automatically triggers the hypothalamus to flood our bodies with the stress hormones epinephrine (adrenalin) and cortisol, to provide the energy to avert the danger. But as soon as the danger passes, the body also evolved to rest and recuperate,and this is exactly what our ancestors did. In our modern world, however, we activatethe Stress Response for very different reasons than physical survival,and allow too little time for rest and recuperation. These days, the Stress Response is triggered mostly by psychological factors, thoughts,feelings or memories. In other words our body responds exactly the same when our loan doesn't go through, our boss gives us a poor performance review, or our teenager doesn't come home on time. Activating the Stress Response for these kinds of factors is not what the system evolved for, and thus becomes a chronic response to stress. When the Stress Response is chronic, the body is forced to ignore the repair and growth functions it would normally be performing. Scientific research has shown that the build up of hormones in our body resulting from chronic stress, contribute to the development of life threatening illnesses like heart disease, diabetes, cancer and hypertension, to name just a few. Since the havoc from chronic stress is inflicted over a long period of time, it can be hard to understand the risk. In my stress consulting practice, clients are regularly surprised by the results of a stress assessment, saying things like "I had no idea! I didn't think it was that bad." This is due in part to the fact that chronic stress has become such a way of life we're not aware of what's going on in our bodies. In addition, tolerance for stress differs from one person to another,with personality and temperament either alleviating or exacerbating the stressors. physical or emotional signals, we're already in stress overload. And for longer term prevention, there are several well researched factors that are known to increase resiliencey to chronic stress. Some of them may seem like common sense, however, common sense is not so common. 1. Regular exercise to enhance muscle functioning, circulation and digestion and to calm the mind, e.g. 30 minutes of exercise daily which can be achieved in three 10 minute regimes or all at once - the effect is the same. 2. Eating nutritiously is essential for good health. It is also a critical factor in mitigating the effects of chronic stress. 3. Deep breathing and relaxation techniques reduce worry and restore physical and mental stamina which in turn diminish chronic stress. 4. A support network of family and friends is a proven protection for managing distress and maintaining resilience. Practice asking for and accepting help from others. 6. Hobbies can be distracting and help remind us about what's really important in life. Remembering the things we loved to do as a child can be a place to start. 7. Ability to deal with emotions helps us recover from stressful events. Knowing how to calm and soothe oneself when anger, sadness, confusion or fear are present is important. 8. Knowledge and preparation are key stress management factors. The more we know about the situation, including how long it might last and what to expect, the easier it is to cope. I hope this information will help you meet the challenge of managing chronic stress and support your good health.